There are many compelling reasons to want to work from home. Perhaps you have small children at home or you can’t stand office politics. Or, maybe you just cannot take the one hour commute to work every day – each way. Whatever your reason, I’m sure it’s a good one. For me, I just like waking up a bit later, working in my pajamas if I want to and never listening to a boss I find to be a complete imbecile. The good news is, as technology progresses, working from home (or telecommuting) is becoming much more accessible. 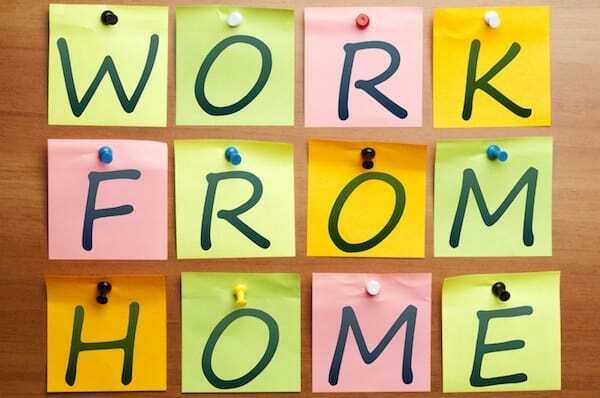 Both self-employment and job opportunities are popping up everywhere; making it that much easier for you to work and/or make money from the comfort of home. Online marketplaces such as Ebay and Amazon have made it very easy to set up a business selling goods online. You don’t need a website or any expensive overhead. All you need is a product and a Selling account and you are in business. If you need help selecting a product, check out sites like Alibaba where you can find almost any type of product imaginable. I recommend you sell what you like. For instance, if you are really into mountain biking and know a lot about quality bikes and gear, you could specialize in that. It really helps to enjoy what you sell so choose a product you really like or believe in. While you won’t need to pay business rent or have expensive overhead costs (at least not at first), you will need to set up a home office for you to comfortably work in. I recommend you find some out-of-the-way place inside your home that is quiet. You will most likely need a desk, printer, phone and file cabinet to store your important work. As you begin to set up your office, you will find there are many online stationery suppliers that have everything you need to set up the perfect home office – with a click of a button. If you have a talent, this can be a great business for you. Do you play an instrument, can you speak a different language, play the flute or or are you crazy good at math? If so, why not share your talent with others through tutoring and receive payment for all that knowledge you have. Tutoring is a huge industry and people can make a nice living doing what they know and love. All you need is your knowledge, some basic people skills and maybe some patience. List your business on Craigslist.com or find an agency to sign up with. Today, it is easier than ever to become a tutor for virtually no cost at all. This one is not for the faint of heart as it certainly comes with a lot of risk. However, if you do have a love of the stock market, and the personality type to deal with the rise and fall of the stock market, perhaps trading could be for you. The invention of the internet and trading sites such as Trading 212, have certainly lowered the barriers to entry in this profession and made trading a profession that can easily be done from home. Trading is a very flexible occupation and you can do it as little or as much as you like. It is important to remember that trading is not an easy occupation. It may take many months and perhaps thousands of dollars in courses to become good at it. You also have to do a lot of research on the companies you are interested in investing in – and the changes in the market can wipe out all of your investment if you are not careful. Taking care of children for parents who need to work, shop, date, dine out and even travel has been a profession for centuries and is a great way to earn money from home. If you love children, then this may well be the perfect business opportunity for you. You can watch one child or open your business up to watching a few at a time. It’s up to you. Craigslist.com, local school’s, agencies and word of mouth are the best ways to get your message out there about our business. This is another great business you can start with little to no investment and if you love children, it is a no brainers.